I am always on the lookout for cool toys for our light table. 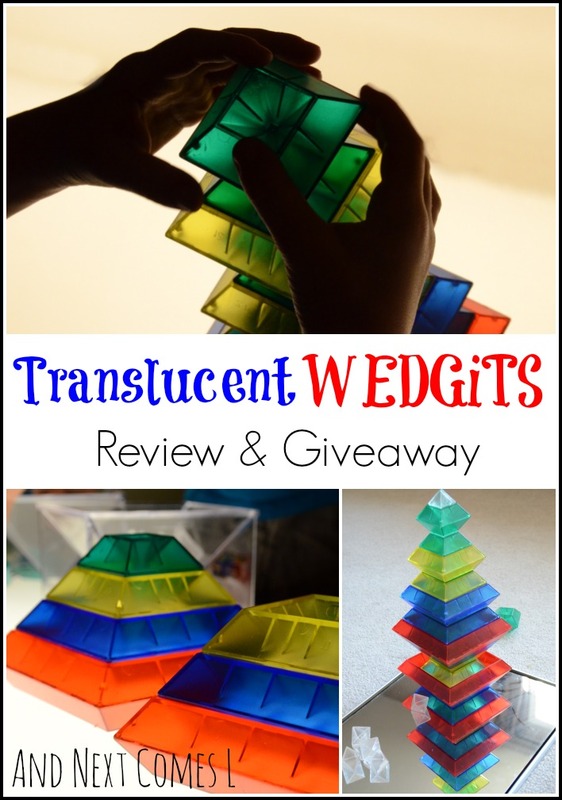 One toy that I have been eyeing up for quite awhile are these translucent WEDGiTS, so of course, I was super excited when I was given the opportunity to review a set of them. We have been enjoying them for a couple of weeks now. I say "we" because I truly like building with them too! Both boys have also been engaging in all sorts of imaginative play using them, ranging from building pyramids for camels, bath tubs for rabbits, and baking layered cakes. Open-ended building, creativity, and light table play?! It doesn't get much better than these WEDGiTS. This post contains affiliate links. I was provided with a WEDGiTS Deluxe: Translucent Set in exchange for an honest review. All opinions expressed are my own and were not influenced by the free product. The WEDGiTS Deluxe: Translucent Set comes with thirty pieces in bright colors of various sizes. They stack. They wedge. And they can be put together to build all sorts of neat creations! The set comes with a booklet of building ideas, but J and K had their own ideas. This WEDGiTS set also comes with two clear plastic building stands, which are easily one of the boys' favorite piece. The love to build inside the stands on and off the light table. Once the boys had the hang of how the WEDGiTS could stack, nest, and wedge together, I set out some tube shots to extend their play. They ended up experimenting and making some pretty neat sculptures. Obviously, the WEDGiTS look amazing and bright on the light table, but they also look fascinating in natural light and on mirrors. Here are a few photos of the boys building tall towers with the WEDGiTS on mirrors. Encourage open ended and imaginative play, off and on the light table. Durable construction. They have been knocked over so many times and the pieces are still in perfect condition. They are built to last! Versatile. You can build so many neat things with them. I love their signature frog design that actually "hops." Since they are designed to stack and nest, they fit nicely inside the plastic stands for easy storage. They do look pretty cool on the light table! Good luck! She would love them, Emma! My kids love these kinds of open-ended toys. I love the fact that they'll be exploring shapes and spatial relationships. Oh yes, the learning that takes place while building with these is pretty great! My one son is now obsessed with small, medium, and large since we got these WEDGiTS! Good luck! my grandchildren would love theses even tho they are all different ages. what a great and unique product. Yes, kids of all ages will love building with these. Even I like to sit and build with them and I am just about 30! I love wedgits and didn't even know they made translucent ones - so excited! We have one set of the original wedgits for 15 3 year olds and I would love to expand that, especially to something I can use with the light table. Thanks for the opportunity! The regular ones are cool, but the translucent ones are like extra super duper cool! Your 15 3 year olds would love these!! Good luck! We love our regular set but these ones would be so cool for the light table. I loved how they looked on the mirror also. Well, if you don't win, you'll have to come over for a play date to check them out! Liam actually enjoys his wedgits! I have always wanted to add to our set and the translucent ones look awesome! That's great that he loves them! It would be awesome if I could help you add to your collection! Good luck! Kingston would LOVE a set of wedgits! I know he would enjoy them, because we played with them at our local children's museum and he was so into them! I really like them too! :) It would definitely motivate me to create a light table. Henry would love these! He loves building and I would love to try something new! Henry would definitely love these! And they would be a great way to keep him busy when the new baby arrives! Im sure my son would love these! He loves to build. And is fascinated by creating new shapes and colours! Well, I wish you luck then, Brandee! I am sure he would have a blast with these! We would love to try these the ways your boys did! Thanks for the great ideas and introducing us to a new product we'd love! E would totally love these! Thanks for entering! Beg away then! Hopefully your name will get picked! My son is in a building phase. Plus he loves bright and colorful things! Then these sound perfect for him! My children love to build- they have a small regular set of wedgits and would LOVE the translucent ones. My twins love building on their light table these would be great. Translucent ones would be a fun addition for your children, Natalie! This is something I would love to test out alongside my grandchildren. I am always looking to explore and review valuable consumer products to give my honest replies and findings. Well, I think they are pretty great! Hopefully you'll get a chance to try them and review them yourself. These look awesome! We love learning products that are incredibly fun!! Fun indeed! You'll probably enjoy them as much as the kids! Our mirrors are from the dollar store, so try there. I can also see my boys building for many hours, months, and years with these! They are so fun! I just made a mirror semi-circle wall to go along with out light table, these would be great to play with! A mirror semi-circle wall?! That sounds AMAZING!! I would love to see how these look next to that mirror and the light table! My older son LOVES these at daycare! I would love to have a set for him at home. That's great to hear that he loves them! Good luck! They are a lot of fun! Thanks for entering the giveaway! my students love the light table and are eager to try new materials on it. The wedgits would be great for another building idea. It sounds like they would be a perfect addition to your classroom! How open ended are these! What fun! You should see the things you can build with them! Oh the possibilities! My daughter loves playing with the set at my aunt and uncle's house and I had no idea you could even buy them anymore! Their set is like forty years old! Have they really been around for that long?! I had no idea! I love watching my students figure out how to replicate the pattern cards with the wedgits. I think the light table would bring a new dimension to their building. There are so many neat ideas of things to make using the WEDGiTS! Aren't open-ended toys the best?! Good luck! My daughter loves blocks and would love these! Well I hope she ends up getting to try them! Good luck and thanks for entering! Oooh sounds like they would be a perfect addition for your light table area! We love our wedgits! These would be amazing on the light table, in the water, or even just in a sunny window. Thank you so much for this blog, I am learning so much! I have never heard of Wedgits before! We would love to win these. My son and I would have hours of fun exploring, making patterns, and building with them. Thank you for the opportunity to win them! How fun! I am so happy to introduce you to so many fun ideas and cool products like these Wedgits. Thank you for entering! The stacking and building of them and the light reflection would be so much fun for my son! Sounds like your son would love them! My girls love to build and stack! They would make a wonderful addition to our stash!!! Sounds like they would be a perfect addition to your girls' stash! My son is a building machine! He loves blocks of any kind. We don't have Wedgits though :( Time to put them on his wishlist! My kindergarten kids love our Wedgits. Translucent ones would make us all very happy. They would be a perfect addition for your classroom, Sandi! My son loves to build!! I've been looking for something new!! Well, maybe you will win! Guess we'll find out soon!! Eek!